Maxwell Krohn and Chris Coyne, a co-founder duo behind OkCupid and SparkNotes, are launching a competitor to Slack. Krohn and Coyne directly drew comparisons to Slack in a blog post announcing the new app, while bringing up the benefits of its encryption. It offers significant security advantages, they argued, making users less vulnerable to hackers: "Keybase teamwork is end-to-end encrypted, which means you don't have to worry about server hacks. Alternatively, you can lie awake at night...fearing a breach of your company's messaging history. What if your team's history got stolen from Slack and leaked or published? The legal and emotional nightmare." In theory, it's an attractive proposition to organizations handling sensitive information (like a media company, say), who might be reluctant to relinquish control over the security of a key part of their infrastructure. 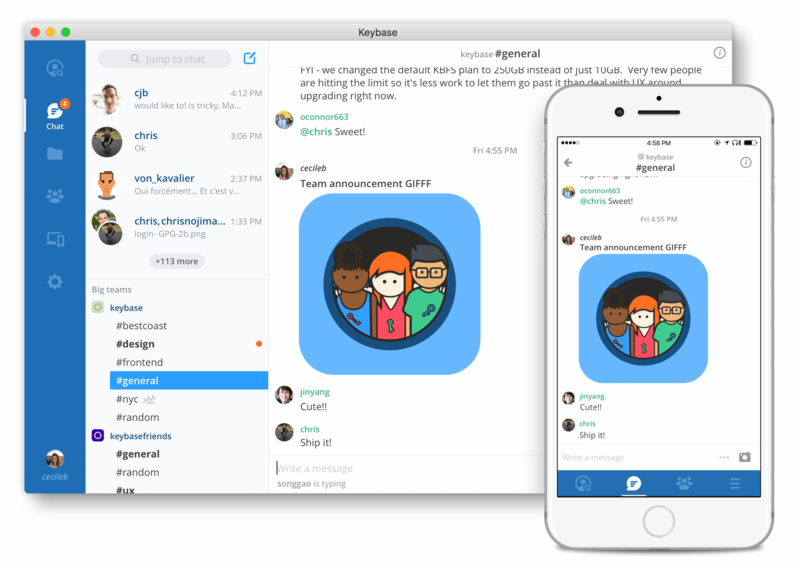 The user interface looks largely similar to Slack, with a mix of public and private channels that teams can chat in, alongside one-to-one direct and group messages. Slack itself is, of course, styled after traditional Internet Relay Chat (IRC) channels. It's also not explicitly targeted at companies and their teams. The startup suggested teams might be based around "any topic": Music, cryptocurrencies, mothers in a particular neighborhood, or just a single family. It's free for anyone to use now, though Keybase says that "if teams take off, we'll charge for larger teams. Nothing we're offering for free now will flip to a pay model, so if you make a 500-person team now and start using it, you won't someday be faced with a credit card screen just to get your files or messages."